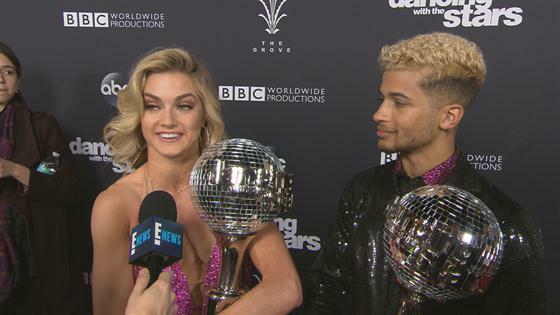 Jordan Fisher & Lindsay Arnold React to Winning "DWTS"
Jordan Fisher and Lindsay Arnold have a lot to be thankful for this Thanksgiving. The Dancing With the Stars pair took home the top prize in season 25 and they have a place already in mind for their Mirrorball trophies. "Thanksgiving table!" Lindsay told E! News after being crowned victor of DWTS season 25. Jordan agreed with the placement idea. This is Lindsay's first time taking home the Mirrorball. She came in second last season with David Ross and placed third in season 23 with Calvin Johnson Jr. and in season 21 with Alek Skarlatos. "Standing there, waiting to hear who wins—I've been there before and I've not won, so going into tonight, I don't want to say I went in with no expectations, but I went in with just the sense of gratitude for the season and remembering that no matter what happens I would be happy with what he we did," she said. "But standing there in that moment, hearing our names called, I truly can't express how great that is because we worked hard and we've done everything we could to get to this point and we made it. And that was enough and that feels so great." What's Jordan taking away from the journey besides the Mirrorball? "Truly there have been so many amazing things that have allowed us both to grow and I think that the thing we're both going to take away from this is what we've been able to impart in each other's lives, and how that has made us better and the friendship and the family orientation that we have been able to establish has been amazing," he said. Dancing With the Stars returns in 2018 with an all-athletes season. Look for Jordan and Frankie Muniz on the Dancing With the Stars: Light Up the Night tour around the United States. The tour kicks off in December.